Has the U.S. proved that winning's in the blood? America's history-making performance at the Winter Olympics on Wednesday summed up why the country has a reputation for winning, and why no other nation should try to copy them – especially the hosts here in Canada. 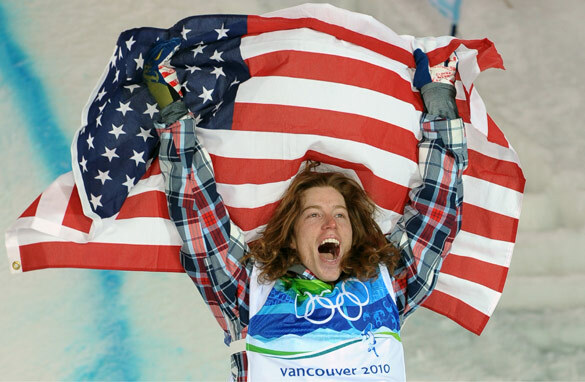 Shaun White's gold on the half pipe was part of an American medal rush Wednesday (Adrian Dennis/AFP/Getty Images). Never before has the United States won so many medals on a single day of Winter Games competition – and four of the six athletes knew exactly what it takes to finish on top of an Olympic podium. On the one hand, you could argue that this makes it easier for them to win again. However, I would say more people fail to carry on winning compared to those who are able to repeat significant triumphs. The mark of a true sporting champion is someone who continues to rack up momentous victories despite the inexorable and burdensome rise of expectation. And the Olympics is one of the harshest competitive spotlights of all. You have athletes from sports that are largely ignored for four years and who are then asked to perform in front of the world’s gaze. Which brings us to the hosts of these Games. This is my first visit to Canada and, while I wouldn’t presume to take Vancouver as representative of the whole country, I’ve enjoyed what I’ve seen. The locals have been friendly, the city feels homely and the surrounding landscape is spectacular. Nearly all Canadians I have spoken to seem to be as self-deprecating as the British can be. For both countries, I would suggest there is an unwritten rule that the Americans can confidently strut as much as they like but we just don’t approach our sport like that. However, the Canadians have approached these Olympic Games like that. There are television adverts banging the patriotic drum, hype surrounds every home medal hope and there is wall-to-wall maple-leaf mania. Now, I’m not pretending for a second that my country – the UK – won’t do exactly the same thing when London hosts the summer games in 2012. But it won’t make it any less of a mistake. There’s a fine line between wallowing in the glory of being a host nation, whipping up nationalistic fervour for the sake of making the event a commercial success and sabotaging your own athletes chances of success. Would Canada have won more medals by now if they hadn’t tried so hard? Or do we have to admit the Americans are just born winners? After all, Lindsay Vonn, Shaun White and Shani Davis hit the golden target, despite everyone breathing down their necks. Honestly. the USA can strut and pose and bask all they want...They are so obsessed with winning it's pathetic. They might win some medals but they do it with so much stage drama and with very little style. The mens luge doubles was downright embarrassing..they were like schoolboys on steroids..ugly,brash and unappealling. The weight of each medal should be divided by the mass of the talent pool: the size of the population of the champion's country. No wonder you can get a few winners from a pool of 300 million. What will pop up after adjusting for talent pool size will be the small countries with several winners. That is much more impressive. Or alternatively, count the medals for Europe as a whole (pool: 495 million) and multiply with 3/5 to compare results with the USA. Wow your logic is flawed. By your logic India, China and Pakistan would be the top contenders. Here is what you are missing. Lets take swimming, each country can send 3 athletes per event so lets just take 20 euro countries * 3 now 3 Americans are going up against 60 Euros! Now if you take euro as a whole that means Europe could only send 3 per event and the medal count would be completely different. You are asking to count all the medals without the adjustment to how many athletes you can send, can't really have one without the other and you wouldn't know how many medals europe would get unless the EU itself entered into the Olympics as a country. You're right. Canada may be winning more medals if there wasn't so much pressure.But as a fellow Canadian I'm ashamed to admitt the short-sightedness of my country in thinking that investing heavily for several years can buy medals. That is clearly the wrong approach. However, on the other hand Americans are not "born winners" as this article would suggest but a product of a national support network committed to winning and competing at the global level. ie. college competition and sports endorsements etc. The comparison is meaningless and without substance. In the end, articles such as these simply work towards the obsession of winning medals, which consumes the olympics. I just wished media outlets would publish more articles that bring to light the olympic spirit rather that just results. Hosting the Olympic games is a big deal for a country. It brings a country together, for the most part, and unites them for a common goal. It is no wonder why Canada has become so marketed and excited for the games. I understand your point about how a champion is one who “racks up the medals,” yet really a true champion is one who puts forth their best effort in order to succeed in their sport. True, the advertising and excitement for the games could possibly affect some of the athletes from Canada. But when you look at the big picture of the games, winning medals is about who puts forth their best effort and reaches to accomplish the task they are there for. The US has a population 10 times higher than Canada, 6 times higher than England, 15 times higher than Australia, 4 times Germany, 5 times France, twice Russia. g clarke, do you know what we Americans are all about. Let me just tell you. In the Xgames, Shawn White fell flat on his face, in fact he could have been killed that day and his face was covered in blood. It must have hurt like hell and if it was me , I would cry and I would complaint for weeks. He could have given up because he was hurt and nobody would think less of him for that. What do you think he did? He got back on his feet and without any fear and as if nothing had happened he continued to skate as if nothing had happened and he won. This is the underlying characteristic of the US athletes . There is a lot of garbage as you mentioned, but the bottom line is that we never give up and in one year we might not do that well, but next year we come back and we kick everybody out of the way and this is why you are talking about us and that is why everyone envies us. What is your point?? China and India have over a billion people. Summer Olympics 2008 Australia was 4th in over all medals with a population of 17 million. I am not really seeing what the size of population has to do with winning Medals. Folks, we are just winning more because we have a more polished system for producing top level competitors at a time when much of the world is seriously pinching their pennies. As an American, I certainly do apologize for the appalling manors displayed by SOME, but certainly not all of our children after they win. So much for grace under pressure and shame on their parents and coaches for not instilling a little humility in these kids. If, as lots of people in Europe are saying, mendacity is one of the characteristic features of US society, this holds particularly true when it comes to America's role (and especially her media) in international sports. Little, if anything, is appreciated when other nations shine but every so trivial aspect of Americans' performances is inflated and cast in shameless bragging limelight. Right now they are deriding Vancouver, ignoring (oh probably not even aware of) the fact that the lousiest Olympics in the last few decades were those in Atlanta. Even the admins here are so biassed that they block similar comments. America is not the sports super power they always claim to be. It's a shame. Not really surprising though. Fairness is less important than business. Glory goes to Canada, Germany, and Norway. Although 'Own the Podium' seemed at the beginning to be an embarassment and very unCanadian, it actually did have quite an effect on our (Canada's) performance. We won more gold medals than any other nation in history. Contrast this to the Calgary games in 1988 where we won zero golds on only 8 medals in total. What Canada found out is that we were tired of a putting on a brave face and being happy to 'just be there' and have always had a desire of going for the gold. We may not have owned the podium itself but we certainly owned the most important part of it – the top step!!!! The US can have its record-breaking bronze total. Canada will take its record-breaking gold.